Chair Based Exercise Instructors Course re-scheduled for January 2016. The Chair Based Exercise Instructors Course due to be held in November, has now been re-scheduled for January 2016. Older People’s Day Let’s Do It Together! We’re delighted to announce our pledge to support the UK’s Older People’s Day which is held on 1st October every year to coincide with the UN International Day of Older Persons. The main aim for the day is a celebration of the achievements and contributions that older people make to our society and the economy. It’s a well- known fact that people are living longer and 23% of the UK will be aged 65 and over by 2035, therefore Older People’s Day supports the campaign to challenge negative attitudes and outdated stereotypes towards older people too. It’s important as we get older to engage in activities which keep us happy and healthy and that’s where Vitality comes in. 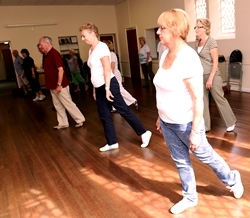 We’re celebrating the UK’s Older People’s Day, with exercise & movement to music classes in Horncastle, Lincoln, Grantham, Sutton Bridge, Gainsborough, Coningsby, Woodhall Spa, Ancaster & Spalding all on 1st October. Over £1,500 raised as Kimberley “Braved the Shave”! 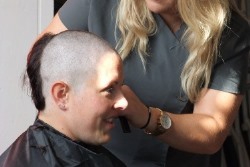 Kimberley Swinney “Braved the Shave” this morning and in the process raised over £1,500 for Macmillan Cancer Support. Her shave took place at St Deny’s Church Hall in Sleaford. 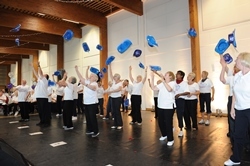 The hall was filled with members of her Vitality exercise class along with Kimberley’s friends and family, all there to give their support and encouragement. It was a slightly nervous Kelly from Halo Hair Salon at Ruskington, whose clippers made the first cut, and once started she made “short” work of the shave. Within minutes Kimberley was sporting her brand new shaved hair style, and in the process has raised vital funds for Macmillan. And it’s still not too late to donate, simply show your support on line by clicking here and search for Kimberley Swinney. 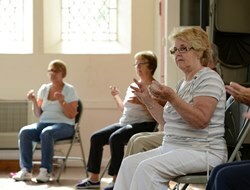 First Well Being Day a resounding success! A record number of people enjoyed the first Well Being Day of 2015. 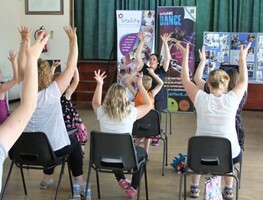 This FREE open access day held at Billinghay, was the first in a series of five events arranged by the Partnership NK “Our Communities” group and involved partners from the NK Arts Partnership, NKOutreach, Vitality, artsNK Dance Team, Lincolnshire Advice Network, NKDC Health Trainers, Environmental Health & Wellbeing Service, NK Social Strollers, and the Volunteer Centre services. Almost 200 people in total attended and whilst the children enjoyed the outdoor activities, the adults kept the partners busy. There was a climbing wall and mobile skate park for the more adventurous or you could learn to use an aerial training hoop with the artsNK Dance Team. The artsNK partnership provided arts and crafts sessions encouraging those who attended to use different crafting techniques to put designs onto photographs of local landmarks and buildings, you could join in a short walk with the NK Social Strollers or if you were feeling slightly more energetic there was also an exercise to music demonstration for all ages from Vitality. In short there was something for the whole family to enjoy. Well Being Hubs could improve your “Vitality”! There’s no doubt that “Vitality” can spice up your life, and what better way to find out how than by meeting the teachers, watching or even taking part in a demonstration at a series of community Well Being open days at various venues around the North Kesteven area.